For a nice easy two-mile ride with no hills, all you need is a pair of cycle clips and a helmet. For longer journeys you can wear anything from regular sportswear to the full Lycra shorts kit. Cycle shorts are good, as they are padded. Some people arrive at work on Monday with a full set of work clothes for the week, others cycle and then work in the same set of clothes. Try different combinations for a few weeks and see how you get on. In winter you need gloves, coats, all sorts. Don’t be put off! Cycling in sub-zero temperatures is absolutely marvellous – you feel really alive. Make sure your hands and feet stay warm. Lobster-claw gloves (like mittens, but divided into two ‘fingers’) are brilliant, and overshoes help keep your feet warm. Rainwear is a matter of preference. If it rains you will get wet – it’s just a matter of how wet, how quickly. Gore-Tex rain jackets are great, with big hoods that go over helmets. 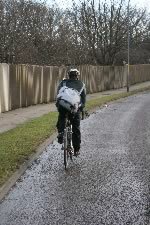 Waterproof trousers are available; cycling tights dry quickly and in summer you just wear shorts. Whatever you wear the outer layer should be a really bright colour. Cycle commuting is a great way to get to work, starting the day with some gentle exercise allows you to arrive feeling energetic, warm and the added benefits are that you will be getting some regular exercise and you can give your car driving colleagues a smug look as you pass them in a traffic jam!